This one-way trip follows Lava Creek and the Gardner River to Mammoth Campground and requires arranging a car shuttle. The trail starts in the open sagebrush meadows along Lava Creek. A short distance in, you come to the beautiful, tiered, Undine Falls. From here, the trail leaves the edge of the canyon along a bench with Mt. Everts in front of you. It rejoins the canyon at the edge of a cliff, giving you great views all the way out to the Mammoth Terraces. The trail follows this rim to the hillside. It travels through a sparsely treed section as it drops down into the valley. A look back across the valley will reveal another waterfall along Lava Creek. The trail transitions into meadows on a primarily south facing slope, which can get hot in the afternoon. The crumbly soil from Mt. Everts frequently gets eroded from runoff and creates numerous washouts over the trail. Elk and bison frequent the ridges, so keep your eyes peeled. The Gardner River flows under the large Grand Loop Road bridge that comes into view, while Lava Creek braids out as it joins the river. The trail begins following the river as it runs along the base of the eroding mountain. Here, the trail goes through sections of cooler river bottom terrain. A footbridge crosses over to the west side of the river. The trail goes slightly up and down as it roughly follows the river. 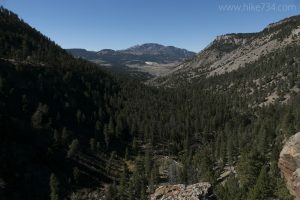 At 0.5mi/0.8km past the bridge, look for the unsigned, steep spur trail that breaks left and heads up to the campground. Trailhead: Parking is located between Mammoth Hot Springs and Tower-Roosevelt at the Lava Creek Picnic Area. Cross the road to reach the trailhead. The ending trailhead is signed as “Lava Cr” and located on the east side of the North Entrance Road, across from the Mammoth Campground.